The Christmas season is once again upon us. It’s a time to love, a time to give, and a time to spread good cheer. Because it’s the most wonderful time of the year, It’s only fitting that I pay homage to America’s most beloved of holidays. In doing so, I’ve set my sights on a region of the United States that has a distinct culture all of it’s very own. Y’all know the place I’m referring to… Oh, I wish I was in the land of cotton, Old times there are not forgotten, Look away, look away, look away Dixie Land! That’s right boys and girls, I’m talking about the South. Home of antebellum plantations, bluegrass music, shrimp and grits, and mason jars full of sweet iced-tea! If you find yourself this holiday season restless and going south of the Mason-Dixon line, then allow me to point you to a few of my favorite places for Christmas in Dixie. You’re fixin’ to have a real swell time down South! Spend some time in any one of these spots and you’re certain to discover that good old-fashioned yuletide cheer! Question: What do the Alps of Germany have in common with the southern state of Georgia? Well absolutely nothing, unless you’re talking about the town of Helen. This charming village, with a population of roughly 500 people, is hidden deep within the shadows of the Chattahoochee National Forest. In 1828, this Blue Ridge Mountain community sprang up out of the glittering dust of the Great Georgia Gold Rush. When gold fever finally ran its course, the town became a hub for an emerging timber industry. Unfortunately, the people there had more saws than they did trees and in the 1960s the town nearly shut down. It wasn’t until 1968, when businessmen bumped heads with a local artist, that they came up with a unique solution to revitalize the town. 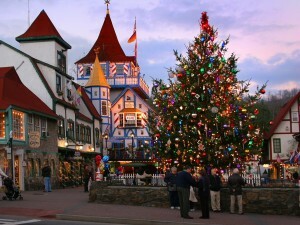 Helen, Georgia would be given a Bavarian facelift; and slowly over the following years, the entire town was recreated to look just like a German alpine village. There are German-styled restaurants, German-themed gift shops, German traditional festivals, and one of my favorites -cold German beer! With all that Old World appeal, this place is just brewing with adventure! When you throw in Santa, horse-drawn carriages, and some holiday lights into the picture, than Helen becomes a place that easily populates the top of my list for spending Christmas in Dixie. 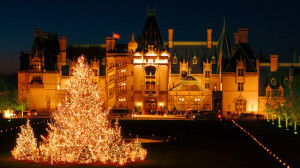 If you wish to step back in time to the Gilded Age of American History, then look no further than the Biltmore House in Asheville, NC. On Christmas Eve, 1895, George W. Vanderbilt opened the doors to his 250 room home for the very first time. Although back then only his close friends and family were invited in; this chateauesque style mansion is now open for all those who wish to grace her halls. If the opulent views from within don’t take you aback, then step outside. The scenic panoramic views of the Blue Ridge Mountains most certainly will! Step into America’s largest privately owned home and feel dwarfed by 35 foot Christmas trees. Take a fascinating tour into the lives of one of America’s wealthiest families. Sip wine with friends; and even enjoy a casual or fine dining experience at any one of Biltmore’s award-winning restaurants. For those with a little shopping in mine, there are elegant stores selling various items from Christmas décor to books and timeless keepsakes. When you visit the Biltmore, you will probably want to stay past dark. The annual Candlelight Christmas Evenings is a stunning sight to behold. From glowing candles, crackling fires, to thousands upon thousands of holiday lights. This is one Christmas in Dixie celebration you do not want to miss! Hey! Is that Patrick Henry I see standing over there? No, actually the good Governor died in 1799; but if you’re standing in Colonial Williamsburg today you might not know it. 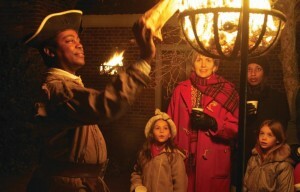 Taking to the streets of Colonial Williamsburg is like taking a leap back into 18th century America. The entire place is a living museum where interpreters work and dress exactly like they did back in the day. Williamsburg served as the capital of Virginia from 1699-1780. It was the political epicenter leading up to the American Revolution. Williamsburg is also home to the College of William and Mary; this center of higher learning opened its doors in 1693 and is the 2nd oldest school in the United States. If you’ve never been to Williamsburg than Christmas is definitely one of the best times to go. During the holiday season you can ride down cobblestone streets, whisking past lines of carolers, perched high inside a horse-drawn carriage. You can relive history as the Fife and Drum Corps marches down Duke and Gloucester St. When you grow cold, warm yourself by a bonfire with a mug of hot cider. Best of all, if you’re dying to catch up on all the latest gossip concerning the British, there are plenty of authentic taverns around that can still serve up a pint or two. Wherever you choose to journey this holiday, whether it’s up north or if it’s Christmas in Dixie, please don’t forget about the most important journey of them all. I’m talking about the one that occurred a very long time ago. 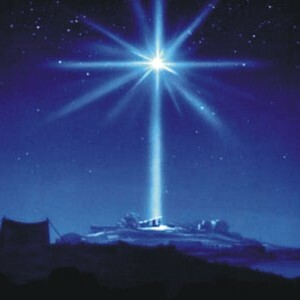 When three noble men set their sights on a mysterious star hanging over an Eastern sky, there became a reason for this season! Thank you for reading my article about Christmas in Dixie. 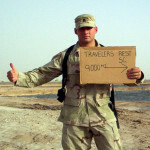 Please visit Big John’s Adventures in Travel again real soon. Feel free to explore other areas of my blost, post a comment, and show some love on social media. A Second Letter to My Boss, from Peru.